A tale of two half-innings decided the outcome of Sunday afternoon’s contest between the Senators and the Baysox. Few at Prince George’s Stadium would have known that a seemingly innocuous second inning would pretty much be the only scoring opportunities either team would get. Justin Bloxom led off with a double over Kyle Hudson’s head that the leftfielder couldn’t come down with on the warning track. Destin Hood followed with a slow tapper to third baseman Ty Kelly that allowed Bloxom to move up to third base. From there, Sandy Leon had a nice piece of two-strike hitting when he was able to elevate a flyball to centerfield deep enough to score Bloxom without even a throw home. For the Baysox, Henry Urrutia led off their half of the inning with a double down the leftfield line. Buck Britton advanced the runner with a groundball to Jose Lozada’s right that he took himself for the out at first base. Aaron Baker strode to the plate with a chance to even the score in the exact same situation as Leon. But this time, Senators pitcher Blake Treinen worked the lefty outside and got him to ground out to Sean Nicol at third base. It was an opportunity to score a run while making an out. 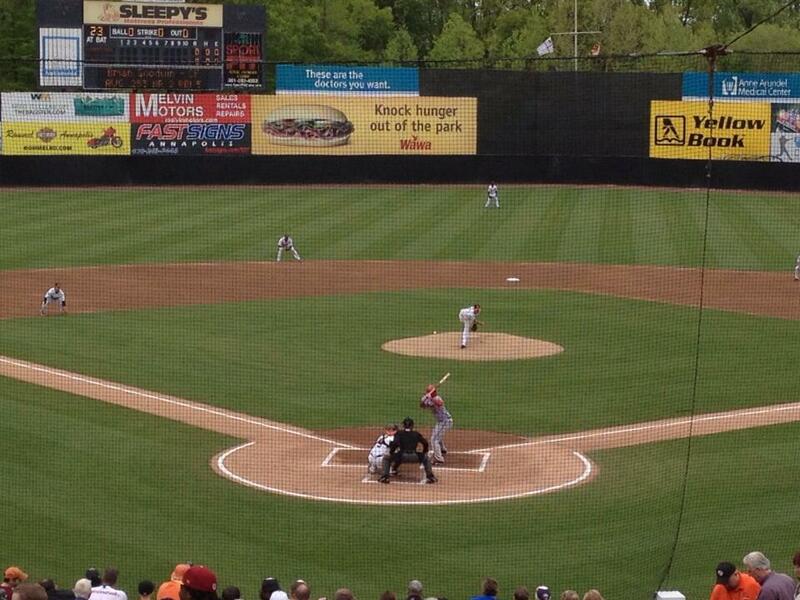 The Senators succeeded where the Baysox didn’t and that made all the difference in the 1-0 victory. • Blake Treinen was simply masterful earning his second win of the season scattering three hits and three walks over 6.2 shutout innings. The righthander regularly challenged Bowie batters on the inside part of the plate and the results were lots of weak groundball outs. • After today’s game, the Senators’ team ERA dipped below 4.00 for the first time since their disastrous homestand against the New Britain Rock Cats. • Justin Bloxom was the only player on either team to collect more than one hit. • Other than Leon’s sacrifice fly, Bowie’s Kevin Gausman matched Treinen zero for zero as he worked 7.2 innings and struck out eight batters. • The Senators played their first clean game since last Monday. In that span, they’ve committed eight errors in four games. • Aaron Barrett earned his second save in as many days as he went through the heart of Bowie’s order like a buzzsaw. Barrett struck out Kelly, Caleb Joseph, and broke Henry Urrutia’s bat for an easy game-ending groundout. He only throws in the low 90s, but it’s a real heavy ball that opponents struggle with when he keeps the ball down. This entry was posted in Recaps and tagged Aaron Barrett, Blake Treinen, Bowie Baysox, Harrisburg Senators, Justin Bloxom, Kevin Gausman, Sandy Leon. Bookmark the permalink.